With the holidays here we all need that extra income, I can tell you how you can do that with just a phone app. It's called 'MAKE MONEY' available for download in iTunes and google play stores. 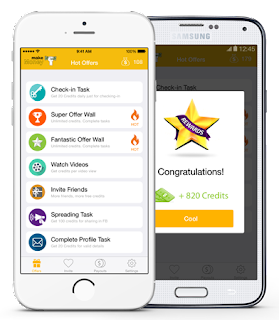 Complete as many tasks as you can in “Hot Offers” tab. The tasks vary and can be watching videos, sharing, completing surveys and downloading apps. We recommend checking the offers stated as “hot” as update often and provide high credits. Once your Credits balance is enough to cash-out you can do so at the “Payouts” tab by requesting a pay-out to be sent to your Paypal account.